The Spanish Wind Energy Association (AEE) has developed the analysis “The necessary elements for an energy transition. Proposals for the electricity sector”. This document has recently been sent to the Spanish Committee of Experts for Energy Transition. With it, AEE aims at making specific and realistic proposals on the contribution of wind power for 2020, 2030 and 2050. Energy transition brings with it the need for long term planning and many challenges for its achievement. 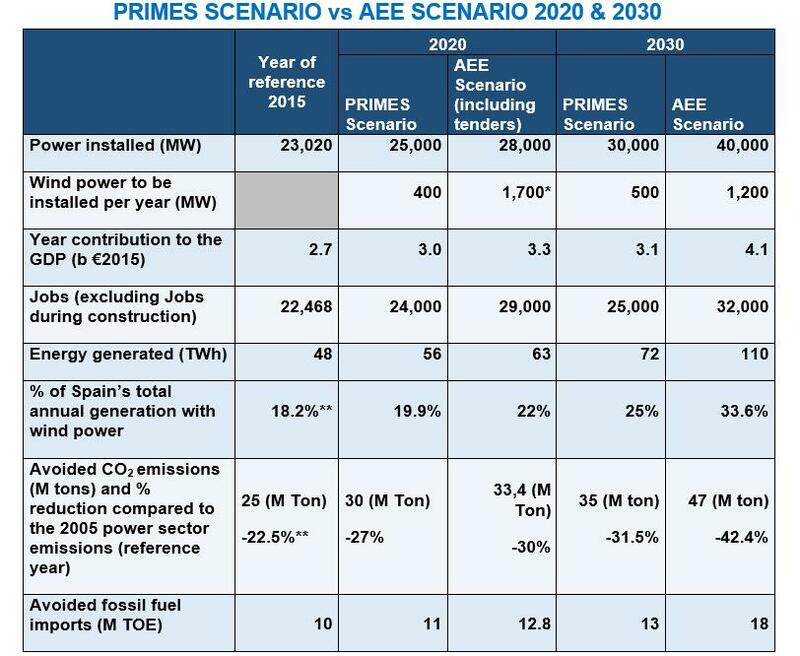 AEE has taken as reference the European Commission´s scenario proposed by the PRIMES model in the horizon of 2030. This model states a very moderate growth in the electricity demand. In its own scenario, AEE has established more ambitious electrification and decarbonisation objectives in order to meet the Paris Agreement goal of achieving at least an 80-95% reduction of greenhouse gas emissions by 2050. Electrification must be the way to reduce emissions, thanks to competitive renewable technologies such as wind power. The electricity sector must move towards scenarios where new electricity demand is covered without jeopardizing emission reduction objectives. As a result of the analysis, the Spanish wind industry, represented by AEE, believes that wind power installed capacity will reach 28,000 MW by 2020 (taking into account the 2016 and 2017 tenders and the Canary Islands wind power quota). This means that wind power would increase by 1,700 MW per year on average between the end of 2017 and the beginning of 2020. In the following decade, it would have to increase by 1,200 MW per year on average up to 2030, reaching 40,000 MW of installed capacity. Thanks to the new wind power capacity included in AEE´s scenario, emissions from the Spanish electricity sector would be reduced by 30% by 2020 compared to 2005 (reference year for the European Trading System, ETS) and by 42 % by 2030. In AEE´s scenario, a 100% decarbonisation of the electricity system would be achieved by 2040. Also, renewables would cover 40% of the demand in 2020, 62% in 2030, 92 % in 2040 and 100% by 2050. The additional 17,000 MW of wind power by 2030 stated in AEE´s scenario are key to cover the reduced output of fossil fuel-based generation plants in the system and to cover the increase in demand as a result of greater economic activity and the electrification of transport. In addition, repowering will be a must, based on the aging of the Spanish wind farms. In order to install the capacity included in AEE´s scenario, simple, stable and secure regulation is needed, also market rules need to be adapted to a system where investments fixed costs will prevail over variable costs. “The current energy model is not compatible with European objectives. Energy planning of the new model must give long term visibility and coordinate transversal policies. Also, the market must offer the adequate investment environment and the fiscal framework must be correct. The governance of the process is key and should be objective and independent. The wind power industry is ready, and it is competitive to provide the system with the wind power capacity required to achieve the decarbonisation objectives, supplying more than 30% of the electric power by 2030. Based on the scenario developed by AEE, the installed capacity in 2020 should be 28,000 MW and 40,000 MW by 2030. By 2050, installed wind power would be 60,000 MW”, says AEE´s CEO, Juan Virgilio Márquez. – The development of new power at a similar rate as last decade would reactivate industrial and technological activities. – The growth of the domestic market would improve the competitiveness of Spanish companies (economies of scale, technological leadership, qualified professionals, etc. ), which would allow for the increase of exports. – Wind farms maintenance activities would even be more relevant. In the analysis “The necessary elements for the energy transition. Proposals for the electricity sector”, AEE suggests a number of specific measures for the electricity sector to facilitate the contribution of renewable energies in meeting the 2030 and 2050 objectives. The measures are based on six different areas: Regulatory framework and planning, electricity market, tax system, new finance mechanisms, technological development and governance. • Defining binding targets for 2030 for the electricity sector and the rest of sectors, that allow the achievement of 80-95% reduction in CO2 emissions by 2050. • Allowing the competitiveness of electricity as a decarbonisation vector, reflecting its real cost by eliminating the non-supply costs in the electricity bill. • Establishment of a stable framework for the installation of renewable energies: stable remuneration mechanisms, a strategic roadmap and a tender calendar. Remuneration parameters must not be revised, in particular, the reasonable return rate. Policies that make predictable future cashflows, such as long term power purchase agreements (PPAs), are required in order to reduce risks and the expected rate of return, which will result in lower prices for the consumer. • Facilitating investments for interconnections to ensure the penetration of renewables and the export of surpluses. • Establishment of market mechanisms that provide long term investments to ensure compliance with the renewable energies objectives and backup capacity and security of supply. • Carbon Pricing mechanism (floor rate in the price of CO2, also extended to transport and air conditioning). • Establishment of an environmental tax system that facilitates investments in clean technologies and energy efficiency based on the concept that “the polluter pays”. • To eliminate pure income oriented taxes on renewable energies, such as regional renewables fees and the 7% tax on electricity generation. • Approval of a National Electrification Plan, that covers all industries, especially road transport. • Establishment of a regulatory framework that includes storage and financial support until affordable costs are achieved. • Establishment of regulatory, administrative and economic/fiscal mechanisms that encourage repowering and life extension of aging facilities to optimize areas with high wind resource. • Coordination measures among all the institutions involved including inter-ministerial plans: state, regional and local. Establishment of a system of responsibilities. • Creation/designation of a single independent entity for the management and control of the Climate Change and Energy Transition Law (i.e. : Intergovernmental-Public/Private Commission) that is obliged to report annually to Congress. The Spanish Wind Energy Association (AEE) is the voice of the wind power sector in Spain. 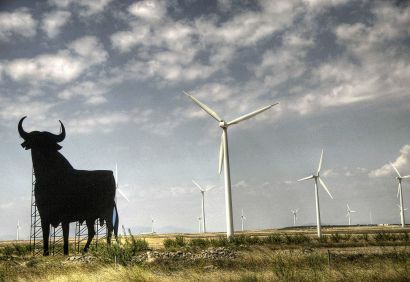 With around 200-member companies, it represents more than 90% of the industry in Spain, it promotes the use of wind power and if defends the interests of the industry. *The wind power sector has a pipeline of 5,057 MW in projects, including those awarded in the 2016-2017 tenders and the Canary Islands quota. To obtain the annual average power, the total power has been divided in three years, although most of it will be installed in 2018-2019 in order to comply with the time requirements of the tenders and the Canary Islands quota. The 500 MW of the 2016 tender have until the first quarter of 2020 to start up.